Our office had a book fair come through earlier this week; they come through three or four times I year. And every time, I browse through but never really find much of interest to me. About a year ago, I did notice that they had some comics that I hadn't seen before. Kids' versions of classic works of fiction like Robin Hood, King Arthur, Frankenstein and Tom Sayer. I finally broke down this week and bought two bundled sets of four books since the prices had been marked down so much. Naturally, when you're trying to condense books down for younger audiences, much of the nuances and subtleties are going to be overlooked. Jonathan Swift's social commentary is unsurprisingly absent, as is much of the character interplay from Robert Louis Stevenson and the scientific details from Jules Verne. The adapters are trying to distill down the stories to something that's comprehensible to a 10 year old, who generally don't have the life experience to fully comprehend much of the subtexts. Which means that these stories tend to focus on the more action-oriented parts of the originals. Gulliver getting captured by giants, Jim Hawkins in a one-on-one fight against Israel Hands, the crew of the Nautilus defending themselves against giant squid, etc. In a lot of respects, it's the same thing that happens when movies are made from these books. What was also noticeable (to me) in these books is that they've gone through some measure of "sanitation" for youngsters. That scene where Gulliver describes just how ugly human skin looks where you're really examining it closely? Gone. Nemo's attacks against slave traders? Gone. The descriptions of Long John Silver's other duties as cook? Gone. The few deaths that are left occur off-panel. This all largely done without any hugely significant impact to the storytelling itself. Of the three I've read so far,Treasure Island seems to suffer the most from this treatment; it certainly remains coherent, but it's not as elegantly handled as the others. I was a little disappointed with 20,000 Leagues as well, since it almost completely glosses over Nemo's motivations. This doesn't impact the story if you're unfamiliar with it, but it does render Nemo rather flat as a character. Some of the edits, of course, have to do with space considerations. Trying to condense a several hundred page book of prose down to 72 page sof illustrations ain't easy, after all! 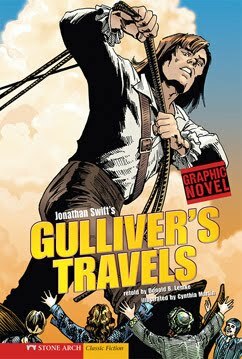 I think Gulliver's Travels is the most successful in this regard by completely dropping the last half of the book, instead of trying to eliminate bits and pieces throughout the entirety of the text. The way Swift had written the original (as essentially four almost stand-alone adventures) it's obviously easier to do that here than with others, but there's a note at the end specifically stating that further tales are in the original. The original books these stories come from remain literary classics for a variety of reasons. They're worth reading. They're worth getting kids interested in. These books from Stone Arch could easily be useful in that regard. Do they replace the originals? Of course not, but that's hardly the intent. If you read these, you'll have just as solid an understanding of the books as any of the movie versions of the same stories. We're not looking at "high art" here; we're looking at a teaser to get people (mainly kids) interested in "high art." And while they probably wouldn't be found in (or possibly even suitable for) your local comic shop, these are certainly worthy of discovery in the children's book section of your local big box bookstore.